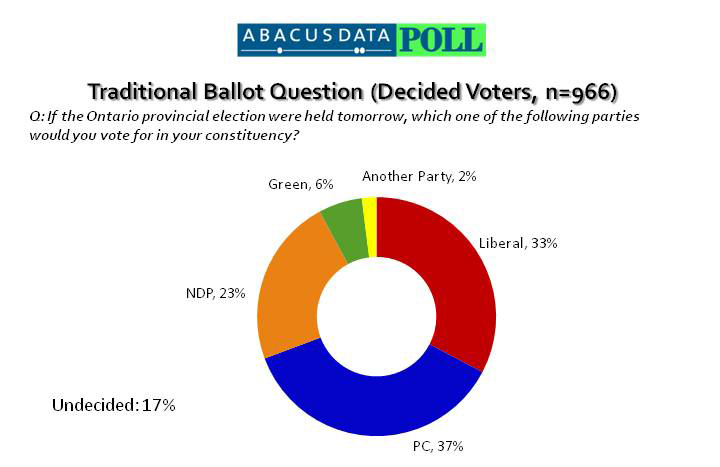 According to a new Ontario survey conducted by Abacus Data, the Ontario PC Party leads the Ontario Liberal Party by four percentage points as the leaders prepare to debate tomorrow evening. Abacus Data measured vote intention in two ways: first respondents were asked how likely they were to vote for each of Ontario’s main parties and second they were asked how they would vote if an election were held tomorrow (the traditional ballot question). The results of both questions suggest that the PCs have a lead over the Liberals and continue to have the most committed voters. However, at this point in the campaign, when respondents are pushed to make a choice, the Liberals are most likely to gain those voters who are torn between voting for more than one party. Province-wide, the PC Party has the support of 37% of decided voters, followed by the Liberals at 33%, the NDP at 23%, and the Greens at 6%. Two percent of decided voters said they would vote for another party. 17% of respondents said they were undecided, even after being asked if they were leaning towards a party. The PC Party does best among men, among voters in Eastern Ontario, and among Ontarians over 60 years of age. The Liberal Party is strongest in Toronto while the NDP does best among women and in Northern Ontario. 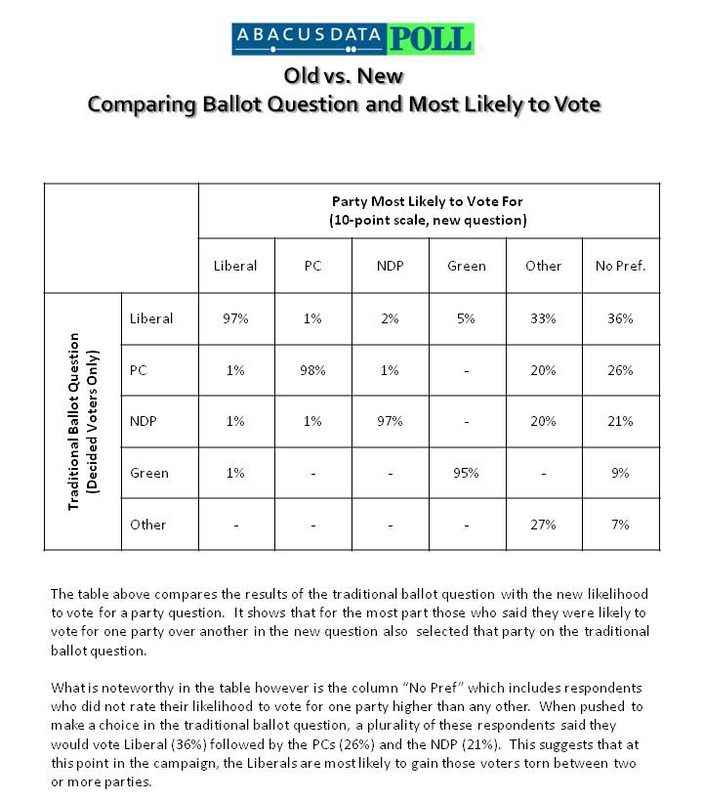 When respondents are asked to rate the likelihood that they would vote for each of Ontario’s main parties, 28% rated the PC Party higher than any other party followed by the Liberals at 22% and the NDP at 18%. Twenty-seven percent of respondents did not rate one party higher than any other. Voters in the GTA (including Niagara and Hamilton) were most likely to say they do not have a preference. The Tories have a lead among decided voters in this region but the Liberals and New Democrats have an opportunity to make inroads there. The fact that 27% of respondents still say they are not likely to vote for one party over any other suggests that the campaign can still have an effect on vote choice and that many voters are still up for grabs. The Liberals and NDP are well positioned to gain these voters but now must close the deal in the remaining days. The non-traditional vote intention question asked by Abacus Data is meant to measure potential vote swings and to anticipate change throughout the campaign. When we compare the traditional question with the non-traditional one we find that both are measuring vote intention. However, when we push “no preference voters” to make a choice in the traditional ballot question, those voters are more likely to say they are voting Liberal. This suggests that unless the NDP or PC Party change the debate, the Liberals stand a good chance of gaining the plurality of those voters. The difficulty for the Liberals is in turning these “no preference” voters out to the polls on election day. The likelihood to vote question (non-traditional question) also allows us to understand the potential for each party to grow. The results from this wave of research are almost identical to those from our first wave of research early in the campaign. The PC Party has the largest block of voters who said they are likely to vote for the party and have seen a small increase in the percentage of voters who could be swayed to vote for the party (from 23% to 27%). The Liberal Party numbers are unchanged from the first wave of research while the NDP has seen a small increase in the number of voters who could be swayed to vote for the party. Respondents were also asked to rate their impression of each of the main party leaders and to ascribe certain qualities to a party leader. Liberal Leader Dalton McGuinty had the highest unfavourable ratings with 49% of respondents saying they had either a very unfavourable (34%) or somewhat unfavourable (15%) impression. Nine percent of respondents had a very favourable impression of the Liberal Leader while 22% said they had a somewhat favourable impression. McGuinty was more likely to be viewed favourably by respondents living in Toronto and among Liberal supporters. The challenge for McGuinty and the Liberals is that only 16% of undecided voters said they had a favourable impression of the Liberal Party leader. More positive for Premier McGuinty was the fact that voters were most likely to consider him to be “calm under pressure” and “intelligent”. PC Leader Tim Hudak also had a net negative favourable rating with 40% of respondents saying they had either a very unfavourable (22%) or somewhat unfavourable (18%) impression. Ten percent said they had a very favourable impression while another 24% said they had a somewhat favourable impression of the PC leader. Hudak did best among men, PC voters, and among Eastern Ontarians. Women and Toronto residents remain a challenge for the PC leader since only 28% of women and 22% of Toronto residents said they had a favourable impression of him. Of the seven attributes tested, Hudak did not score highest on any of them. Considered a wild-card throughout the campaign, NDP Leader Andrea Horwath has a net positive favourable rating with 40% of respondents saying they have a very or somewhat favourable impression of her while 18% indicated they had an unfavourable impression. Her challenge remains the fact that 42% of respondents had neither a favourable nor unfavourable impression indicating that she remains an unknown quantity to many voters. Horwath’s strength is that voters are most likely to consider her the leader that is “down to earth” and “friendly”. However, she is the party leader most considered to be “inexperienced.” Increasing her profile and connecting with voters while overcoming the “inexperienced” label will be her objective in the debate and over the remaining 10 days of the campaign. From September 23 to 25, 2011 Abacus Data Inc. conducted an online survey among 1,201 randomly selected Ontario Canadian adults from a representative online panel. The margin of error—which measures sampling variability—is comparable to +/- 2.9%, 19 times out of 20. Results of the survey were statistically weighted by gender, age, region, and education using census data from Statistics Canada and by past vote using Elections Ontario results from the 2007 Ontario provincial election. Totals may not add up to 100 due to rounding.